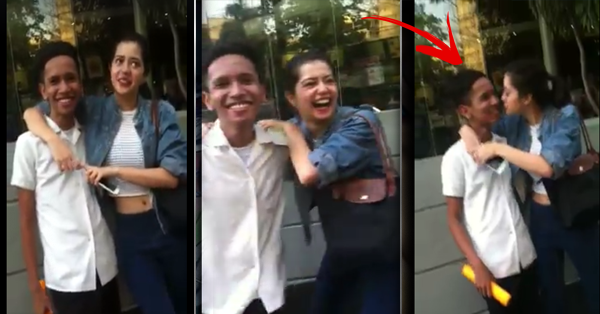 Hokage Moves of Kuya to Sue Ramirez Goes Viral Online! Sue Ramirez is an Irish American-Filipino actress. Her first major role was as supporting cast member on the ABS-CBN remake Mula Sa Puso. She appeared in the television dramas like Angelito: Batang Ama and Annaliza. Because of her talent in acting together with her beautiful, sweet face, she has been starting to be recognized by a lot of people. Now she has gathered her own fans and supporters. A video clip was uploaded last September by a Facebook user named Marathy Aragon. In the short clip, it can be seen that Sue Ramirez is singing Happy Birthday Song to a student. It is claimed that this video was taken in Davao when Sure Ramirez was invited to be a guest. While singing, the guy is very happy with all smiles on his face. He even hugged Sue while enjoying his birthday gift. After singing the Happy Birthday Song, Sue will give a Birthday Kiss but the guy faced her and too close to kiss her on her lips! Shocked by the incident, Sue was able to give a good laugh about it and keep her cool with her. The people who were there in the place were also shocked, but at the same time happy because of the time Sue gave to them. Watch and see the Hokage moves of the guy in the video! Yung muntikan na kayo Maghalikan ni Sue Ramirez . HAHA 󾌴󾌴 Grabe na shock na lang kami dalawa hahaha #GalawangHOKAGE! #Davao!